"Nothing is better than fresh, hand-picked strawberries. It seems like you always pick too many though! 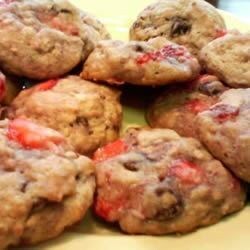 Make these wonderful cookies with your extra berries." Combine the strawberries with 1/4 cup sugar in a medium bowl. Toss gently to blend, and set aside. Combine the flour, baking soda, and cinnamon in a large bowl. Stir in the rolled oats and blend evenly; set aside. Beat the butter, brown sugar, and white sugar in the large mixing bowl of an electric mixer at medium speed until fluffy. Add the egg, milk, and vanilla, and continue beating until smooth. Stir in the flour mixture, and mix well to blend. Combine the strawberries with the flour mixture, and stir to blend. Drop by teaspoonfuls onto ungreased baking sheets. Bake in preheated oven until slightly brown, about 8 minutes. Cool on baking sheets. Store in an airtight container. It was pretty good, but the listed cooking time was too low and my beutiful work turned into floppy cookies! Add a couple more minutes and they will be PERFECT! These cam out wonderful. I had fresh frozen strawberries. I used old fashioned rolled oats. I did not have quick oats. They are chewy crispy goodness.